Now that the blog is back up and running I find myself struggling what to write. Not that I can’t think of anything to write about– quite the opposite. I want to tell you about my quick Christmas trip to Boston, the lamest of lame New Year’s Eve and marriage lessons from an unexpected source. I also want to write about the daily experience as well, and maybe that’s as good a place to start as anywhere else. Right now I am writing on my lap top sitting on my bed in my room that’s about 12’x12′. My in-laws are in their perennial spots on the couch in the living room watching Spanish TV. No, they don’t speak Spanish. They don’t speak English either so I suppose a Spanish channel makes as much sense as an English one, but still that makes me laugh. The other night my father in law was watching TV in Chinese. I have no idea what he was getting from it; I don’t expect a trip to Beijing is in the cards for them anytime soon. Damir is at his cousins’ who live around the corner watching some football. I am super hungry, being 8:45pm and well past dinner time, but I haven’t yet found the strength to venture to the Dreaded Kitchen. The kitchen is disputed territory in our home. I have conceded the living room and the dining room, but the kitchen still remains hotly contested. Yes, I have considered putting a hot-pot, mini-microwave and fridge in our small bedroom to make the kitchen obsolete entirely, but let’s face it: one cannot live on ramen and cheetos alone. Or so my doctor says. So I continue to fight the good fight. Well, of course I am exaggerating. There is no fighting, it’s more of a tug of war. But war, yes, yes it is. The main problem is that our kitchen is super small, clearly designed by a man who never cooked a meal in his life, and really only one person can cook at a time. I have been patiently waiting for my in-laws to finish dinner so I can go in and cook in peace without getting in anyone’s way or anyone else getting into my way. Even when Damir and I cook a meal together we are bumping and shoving each other (with love) to get what we need. My mother in law is a great cook, no doubt about it. And she cooks a lot. No cookbooks, no ready-to-eat. She makes good stuff all from scratch. Every week there is fresh bread she has baked. Right now (I moved and now writing in the kitchen for inspiration) I am staring into a bowl of doughnut concoctions that she made a few hours ago. Diet? Huh? Everything she makes is traditional Yugoslavian… stuffed cabbage leaves, meat pies, meat stews, meat casseroles. Lots of meat. But hearty, flavorful food. That takes forever to cook. Hence, when she is home she is constantly cooking. This is a problem for me, though I like what she makes, I want to make my own stuff too. I actually like to cook. When I moved in I brought all of my kitchen utensils and tools with me. And most of it remains down in the basement except for a few critical pieces, since they had most of it here already. But for some reason my stuff that did make it into the home frequently gets broken or goes missing. I am not sure why… if it is purely accidental or a form of covert warfare. But it drives me crazy that it seems like the things I bring into the house are not wanted. That’s my perception, but I have no evidence to say that it’s 100% true. That brings us to the story of the two microwave ovens. 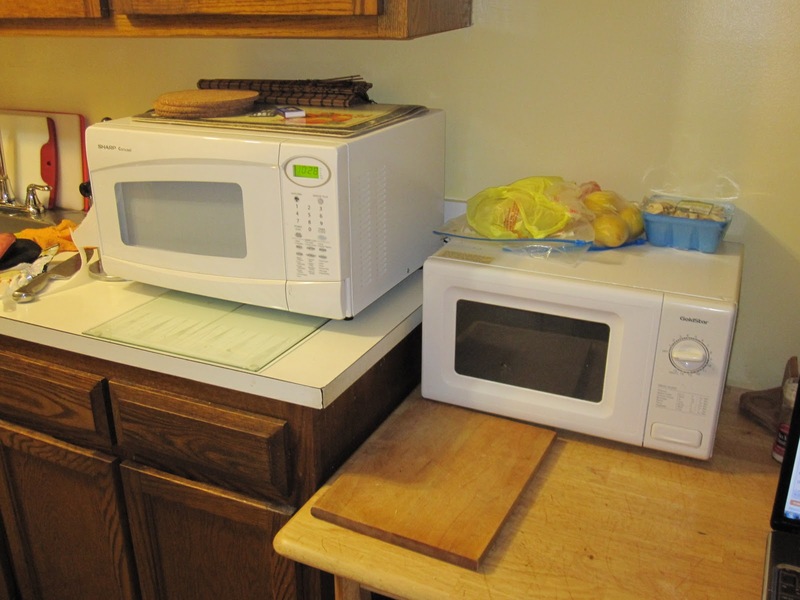 When I moved in the family had a older small microwave oven (the one on the right above). It didn’t work so well, but well enough. Cooking options were limited with just one heat setting and a timer on a dial. Yes, I use the microwave liberally. It’s useful when I get home from work so late to pop in a burrito or lean cuisine for dinner. So this past summer Damir and I made a trip to BJs for some staples and see these great microwaves on sale with lots of bells and whistles. So on a whim we bought it and brought it home. We dismantled the old microwave and put it to the side until we could take it out to the trash. The new microwave arrived with much fanfare. We showed his parents– look what we got for the Dreaded Kitchen! Showed them the basics and moved on. Fast-forward a few hours. In my bedroom I am getting ready to go somewhere and my ears perk up to hear a funny sound. What was that? Was that… was it? The old microwave’s done chime? No, it couldn’t be. We got a NEW microwave. How could I possibly hear the old one’s chime of done-ness? Surely I was hearing things. But no. 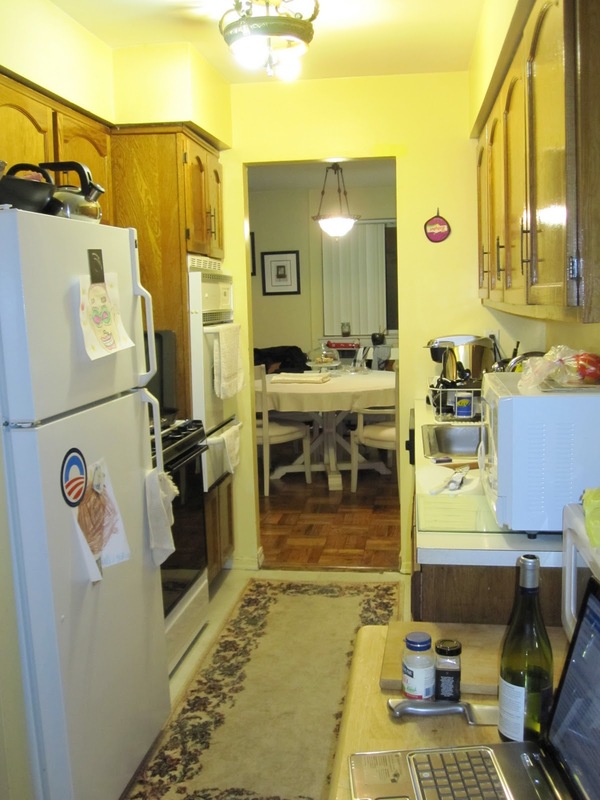 I peaked into the kitchen and see the old one stacked up next to the new one, as it still lies today in the photo above. My mother-in-law quietly reinstated the old beast of a microwave when I wasn’t looking. In protest of the new? Out of confusion of how the multitude of buttons work on the new one? In an effort to shun anything I bring into our home? I don’t know the reason. And I never asked. I just let it be. Though every time I look at it I think it is mocking me. One of the big lessons I have learned since moving here is that there are some fights that just aren’t worth fighting for. Everything doesn’t have to be done my way.